The Vintage Western toys featured in our Western Funhouse photo albums are from the 1930s, 1940s, 1950s, and (in some cases) beyond. We've corralled some fine examples of these toys from days gone by for your viewing pleasure. Perhaps they will bring back some fond memories or simply entertain you with their good old-fashioned style. Enjoy! 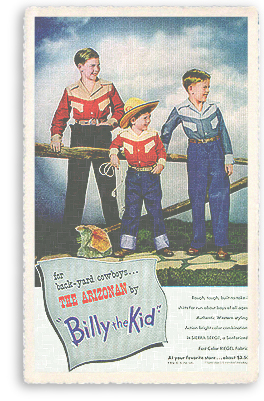 Pictured right: Three young buckaroos are dressed in real cowboy style, circa 1950.